Arlak anti aging combo contains Arlak Be Newish anti aging serum, arlak face wash, arlak anti acne soap & arlak face value pack. This combo is specially made up for both men and women. By using all the products properly you can not only get rid of anti aging and fine lines problems. But also prevent from harmful things which leads to aging and wrinkle problems. 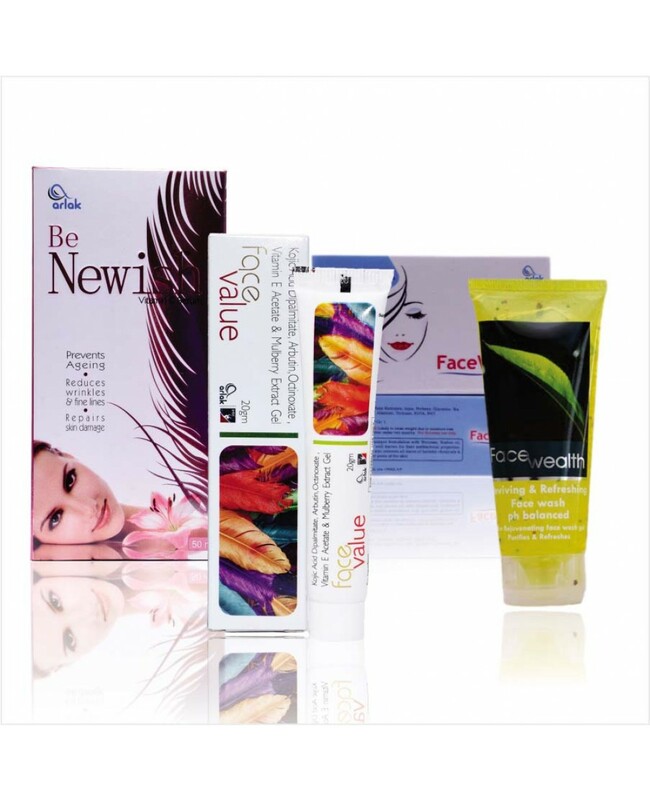 Accelerate the synthesis of collagen, improve the luster of skin. Strong antioxidation, eliminate the Free radical in body. Resist the inflammation of skin, inhibit the bacteria. Possess the structure of lipophilic and hydrophilic. Excellent stability of light, heat, acid, alkali, salt and oxygen. Stable form of Vitamin C.
Fast acting- results on the face show up within few days. Vitamin e plays a role in the anti-aging of skin. free radicals are believed to play an important role in skin aging and therefore the antioxidant activity is quite valuable for giving a younger look sto the skin. Almost half of the body’s HA is located in the collagen of skin and it is logical that HA plays a vital role. Hyaluronic acid helps to retain over a 1000 times its weight in water within the cells of skin, making it an excellent moisturizer. In fact, no other biological substance can retain as much water as HA resulting in increased smoothness, softening and decreased wrinkles. Equally important is its ability to remove waste matter from cells including those where there is little blood circulation. a natural skin lightening alternative. Relieves symptoms of itching, swelling, and redness. Effective in reducing redness and irritation.